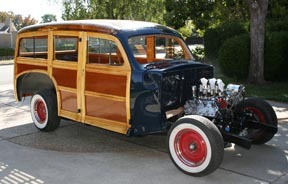 The project is a '48 Mercury owned by Phil Iatomase of nearby Willow Glen, CA. 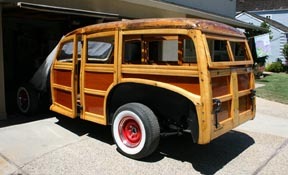 The car needs to be stripped, sanded, bleached and varnished. 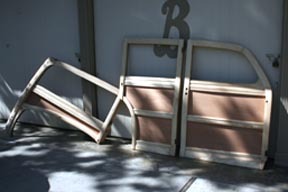 There are a few rotted areas that will need to be repaired as well as make new inner and outer panels. 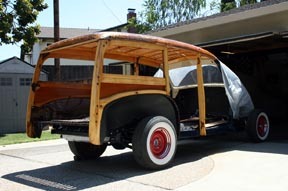 After about a week, all the wood is removed and the roof assembly is ready to be lifted off before the chassis goes out for refreshing. Temporary posts hold the roof assembly in place. 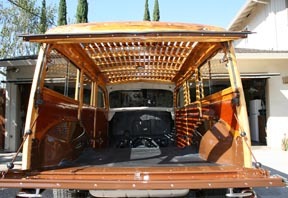 The underside of the roof assembly was stripped of old varnish and sanded. 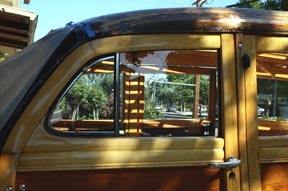 New pieces of maple were shaped and glued into place where the wood was rotted along the bottom edge of the rear header and the side rail where the rear door post tenon is located. On the rear header repair, the rabbet for the lift gate hinge was made before glue-up. The ends were notched to make the rear posts fit as before. 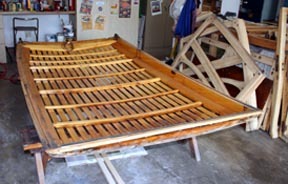 Here is the roof assembly after 6 coats of varnish. The domelight wire is added in preparation for installation when the chassis is returned. Meanwhile all the other pieces are stripped of varnish and sanded. Any repairs are made at this time. The next step is to bleach all the wood. 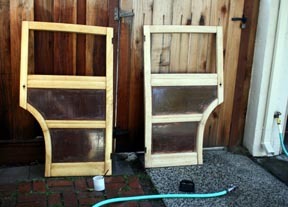 The door on the left has oxalic bleach applied. 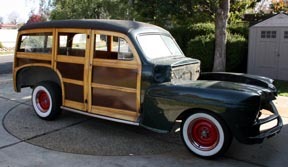 After soaking for a few minutes, the wood is washed with clear water and lightly scrubbed with a medium 3M scrub pad. 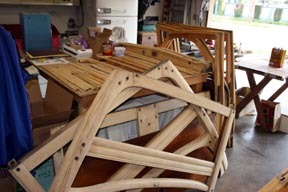 Here the front doors are drying after their bleaching process. All the bleached pieces will be lightly sanded again to remove any raised grain caused by the bleaching. 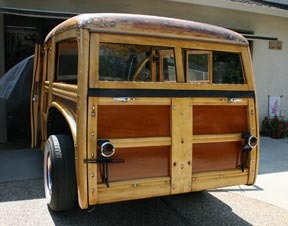 The old panels are removed and all wood is sanded smooth. 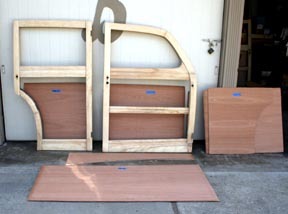 New Honduras mahogany panels are rough cut to size for the inner and outer door panels, 1/4 panels and tailgate. 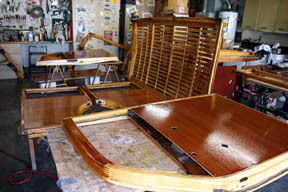 Here the new inner and outer quarter panels are being glued-up. The forward panel halves have been assembled, while the rear pieces await assembly as soon as the contact cement is set-up. 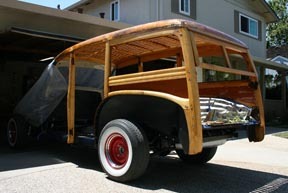 The tailgate is glued-up in the same manner. 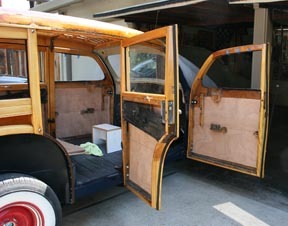 Here is a pic of the passenger side doors and quarter panel with new mahogany panels trimmed to fit and installed. The inner panels are trimmed to fit. The mounting hole locations and door handle locations have been located and drilled. The tailgate panel is fit and installed also. After a final sanding, the first coat of varnish is applied to all the wood pieces. The first coat is thinned about 25% to get a nice easy flow. 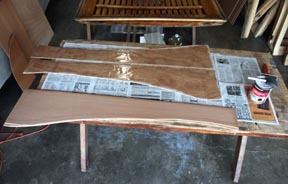 Additional scuff sanding will follow each coat. 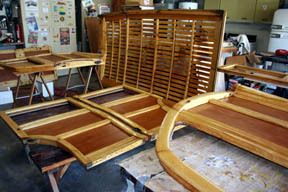 Here the inside surfaces get a coat of varnish. I'll alternate from front to back untill I get 6 coats of varnish built up on all surfaces. 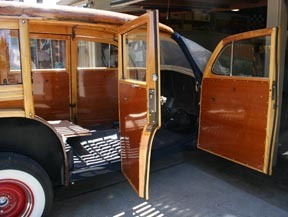 With the chassis back from its refurbishing process, the wood can be reinstalled. 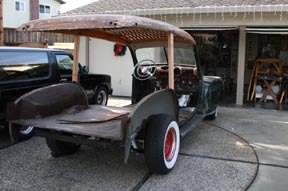 I set the roof assembly back in place with temporary rear door posts, then carefully reinstalled the center door posts and quarter panel assemblies. All roof brackets and t-nuts are installed and the access holes for the t-nuts are filled. A couple coats of varnish are added after a final sanding of all roof surfaces. The liftgate is installed while I wait for the door hinges to be painted. 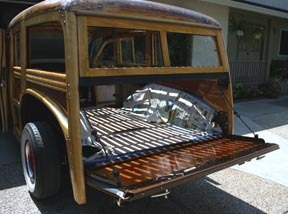 The hinge, support bar and dust seals are added to the tailgate before it is installed in place. The tailtights are located and clearance holes are drilled for the actuating arms and wires . 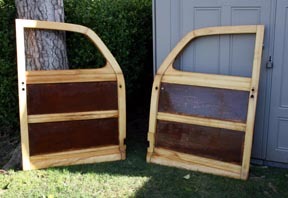 The hinges are fastened to the doors and then the doors are mounted on the cowl and center door posts. All tailgate hardware is replaced: handles, support arms and taillight assemblies. The liftgate glass and rubber gap strip is replaced. Taillight actuator arms and wiring are fit thru panels and checked for clearance. 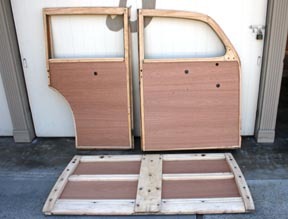 Now the door glass and crank assemblies can be installed using new window felt and channels. 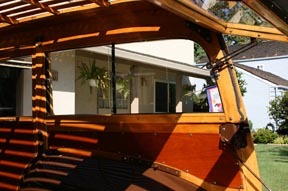 All door glass is installed along with crank mechanisms, latches and trim pieces. New vent window rubber and stainless felt channel was installed also. 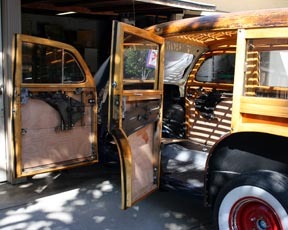 The inner door panels can now be installed after all the door glass is in place. The lift gate sliders and hardware are now installed along with new weather seals. 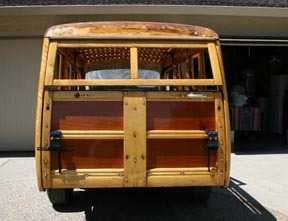 The sliding rear window locks and grip handles are added. All hardware, other than door handles, is installed with new stainless steel screws. A final check is done to make sure everything is working properly. The outside door handles still need to be attached. 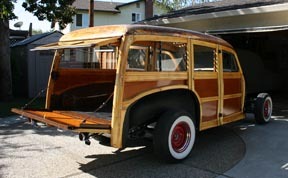 Another woodie project is finished and ready to have the sheetmetal reinstalled.